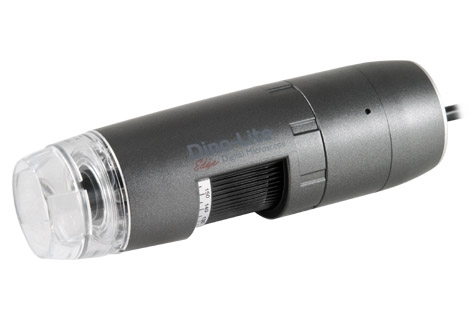 The Dino-Lite AM5212TL is one of the latest TV-interface with long working distance (LWD) feature. This LWD model yields higher magnification and larger depth of field under the same working distance though the highest attainable magnification is smaller. 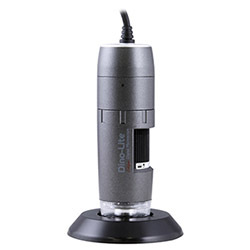 This feature provides greater clearance between the microscope and the viewing object, which can be helpful for applications such as repairing or assembling. Combined with totally revamped optics and high resolution 960H, it is the latest upgrade over its predecessors such as the AM4112 and AM5212 microscopes with TV output. Also, like all standard magnification models on the Edge series, this microscope incorporates a 10X to 140X magnifying range and interchangeable front caps available to suit different purposes. The current available options are close cap, open cap, diffuser cap, extended cap, long cap, and sidelight cap. The AM5212TL does not require a computer or bundled software to operate and works simply by connecting it to a conventional TV using the supplied composite video cable. It is available in either NTSC or PAL video standards depending on your region of residence.